The public is invited to the meeting to learn about a proposal to address contamination at the Willetts Creek Wetland Areas portion of the Dzus Fastener Co., Inc. Site (West Islip, Suffolk Co.), within New York's State Superfund Program. Public comments also are welcome at the meeting, and during a public comment period that runs through August 21, 2017. Project documents can be reviewed at the West Islip Public Library at the location identified above, attention: Donna MacGilvray; phone: 631-661-7080. Search for frogs, turtles and birds along the boardwalk and use instruments to recreate the sounds of the swamp. For children ages 3-12. Note: This program takes place at Great Baehre Swamp in Amherst. Registration required; call 716-683-5959 to sign up. The Town of Islip is co-sponsoring this free fishing clinic with DEC. This clinic is geared towards families, but it is open to all. The clinic will focus on fishing techniques, biology and stewardship. Pre-registration is required with the Town of Islip. Call 631-224-5430 to inquire. This event is free. I FISH NY will provide loner rods and free bait. No Freshwater Fishing License is needed during the hours of this event. 1285 Fisher Avenue, Cortland, NY 13045, Phone: (607) 753-3095 extension 220, E-mail: R7.UMP@dec.ny.gov. 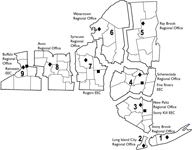 The New York State Department of Environmental Conservation is beginning the Unit Management Plan (UMP) process for 384 acres including the Camillus and Split Rock Unique Areas in the Towns of Camillus and Onondaga in Onondaga County, New York. The public is invited to share their ideas about plan development during the comment period which runs through October 10, 2017. In person at a public comment session scheduled for: August 10, 2017 from 6:30 p.m. to 8:30 p.m. at the Camillus Town Office located at 4600 West Genesee Street, Syracuse, NY 13219. Or you may mail, call or e-mail the contact above with your comments/ideas before the comment deadline of October 10, 2017.